Want to wake up to your favorite iPod music? Need a 7-5-2 feature for separate weekday and weekend alarm times? The iHome ZN9 Dual Alarm Stereo Clock Radio is the first radio for Zune. 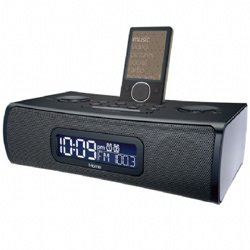 It allows you to insert your iPod into a dock built into the top of the clock radio for recharging. More than that, you can play the contents of the iPod via the clock radio. The sound quality is fantastic with high-fidelity stereo drivers delivering great quality and depth. One can be gradually roused awake through the increase/decrease volume function to prevent any abrupt and startling wake-up call. Experts claim that being roused awake pleasantly will put one on a great footing for the day. Although the design of the clock is rather boring and staid, the ZN9 can wake you up from the right side of the bed. The ZN9 enables you to know that there are incoming calls when you dock your iPhone although you cannot answer them. The good reception from AM/FM stations also keep you alerted to news around the clock.